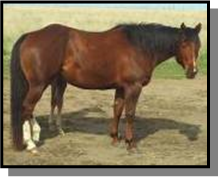 Click on Mares name for extended pedigrees. Gorgeous, BIG hipped, heavy muscled mare. Dam was finished team roper ridden by Mark Wray. Jae Bar Tip (NCHA $). Very few Sun Frost dt’s left and she’s one of the prettiest. 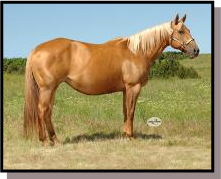 Her dam is a full sister to RNJ Abigail (dam of CPRA super horse JG Hectors Pizzazz, aka Sonic). Another Frenchmans Guy dt. Maternal 2nd dam was 7th in Nation High School Barrels, top Pole bender, multi– time saddle winner. 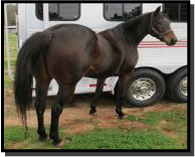 Super kind mare that is STOUT all the way around and very balanced. Broke to ride. Super disposition and always puts a outstanding foal on the ground. OUTSTANDING 2D mare in just 5 runs and then we started breeding her. Dam is a multi champ. barrel/pole mare. “Buttons” is the kindest mare you’ll find, super quiet with ton’s of brains. Her babies are the same. Straight from the Mel Potter Ranch. “Dinero” has won $400,000 +, his offspring have won over 2.3 million. 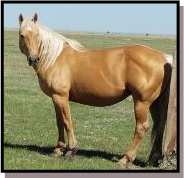 He is the sire to Sherry Cervi’s pro barrel mare Stingray. The Potters have had many champions using the Sun Frost, Driftwood cross and we've found the same… pure QUALITY. She’s super thick and stout. 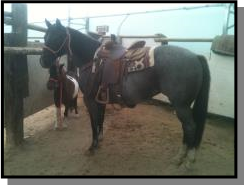 Another “Dinero” mare from the Potter’s! This mare has a unique maternal side being a grand dt. of cornerstone mare, Corina Too, who was an unbeatable match race champ. 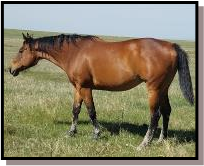 Corina Too is still found in the pedigree of two of the Potters current broodmares, including this mare’s dam– Figure Four 449. 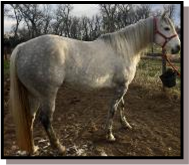 Full sister to YO Blue Drift, top barrel and rope gelding in OR. 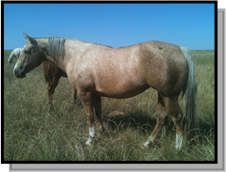 Driftwood mares on Pat have always produced outstanding offspring. Mr. Poco Drift was Haythorn Ranch bred and we were told there was nothing in the pasture you could tie onto that he couldn’t pull. 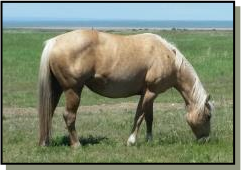 Unique Palomino roan color, her first few Hotrod foals have all been red roan and palomino! 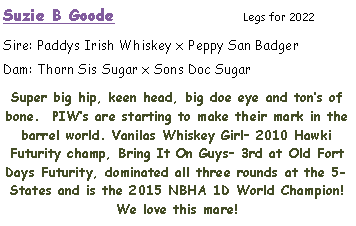 This mare is owned by Kaylee Gallino and is a FULL sister to her great barrel horse, “BOB”! Bob has won thousands of dollars in both the Pro and Ama circuit. He is the West Fest arena record holder and back to back champion in 2016 and 2017. He is a 2018 qualifier for THE AMERICAN! We are so excited to have her here to breed to Dashing Move Fame. Dt. leading Barrel sire Frenchmans Guy. Cow bred dam - Cal Bar, Gay Bar King. Great mind and disposition. 2018 American 4th place qualifier was Jane Melby’s Shameon U, a DTF crossed on a Gay Bar King grand dt. They can get it done. 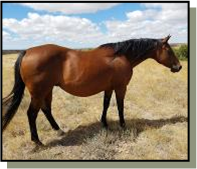 This mare was bred by Blue Borton and is out of the dam to her great champion barrel and all around horse “EARL” (Missin Earl). The filly’s sire is the booming Irish Pay. 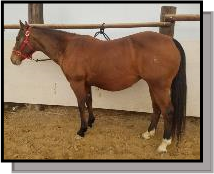 Roxy already has a colt by A Smooth Guy owned by the Sampson family and is in foal to Streakin Hotrod for 2019. 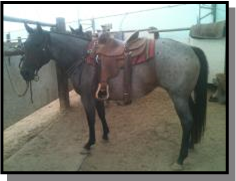 Pro Barrel mare formerly owned by NFR Qualifier. We’ve always wanted a DTF dt. and so happy we found her! Gorgeous, great bone, BIG hip. “Spendy” is bred to Fiestas Gotta Gun. 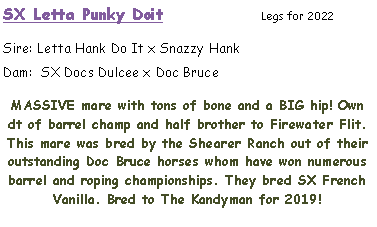 The bloodlines of the great Playgun on WPRA barrel money earner of over $800,000 Firewater Fiesta! Easy- My other personal horse for years. Rocking chair lope, broke to death, extremely soft in the face, finished breakaway, shown in Ranch Horse. A direct dt of Pat Cowan. She will put speed and the Sun Frost substance in her foals. Uno- My personal riding mare for 5 yr’s. Finished breakaway, cutting training, shown in Ranch Horse, extremely quick and powerful mare that no cow could get away from. She puts a POWERFUL baby on the ground every year we drool over! Hotrod’s fastest race offspring was a AAA runner out of an own dt. of Special Effort. 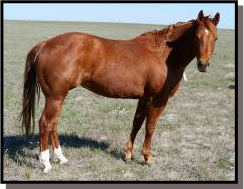 We hope to duplicate that genetic cross with this mare. Sir Austin Duncan has prod several stakes winners and pro barrel horses. She’s a big mare with ton’s of bone and a super gentle, calm disposition. This cross is a good one. Suzies Kitty’s sire– High Brow Cat. NCHA $76 Million sire as of early 2018! Fiestas Gotta Gun x Playgun and outta Firewater Fiesta!!! 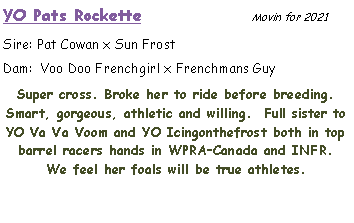 Check out her 2018 filly x Repete Offender!